Every business person understands that your net profit is a combination of top line revenue and gross profit, less expenses. And while controlling expenses is important, the main reason every pharmacy owner went into business was to MAKE money, not save money. If saving money were your goal, you would be working for someone else. Unfortunately, every other vial company wants to talk about how cheap their products are. We don't mind, since we can - and do - compete with everyone on helping our customers save money, but of the two contributors to your net profit, savings is only one part - and the smaller part - of what determines your overall profit. The larger component is your top line revenue and gross profit, and no other vial manufacturer makes products that can help increase and grow that portion of your business-only TSD. And make no mistake about it, without continued growth and new customers, no business can succeed in the long run. You simply cannot cut costs fast enough when your top line is not growing, and the American retail markets are littered with the bones of companies that went bankrupt from this very situation - and others that are teetering on the edge even today. So when you evaluate which vial will provide you with the greatest financial benefit, don't be lured into looking just at cost. Instead, look for vials that can work for you to help with both your top and bottom lines at the same time, and when you do, only TSD has solutions that help you at both ends of your income statement to make your bottom line larger and healthier than focusing on savings alone. Click here for more information on how the Pillboard products can help you today! The ProTect® reversible vial system features the most unique closures in the market today. Mass media advertising is expensive and the impact is minimal. Flyers, inserts, bags, etc all get overlooked and thrown away within minutes once the customer gets home. 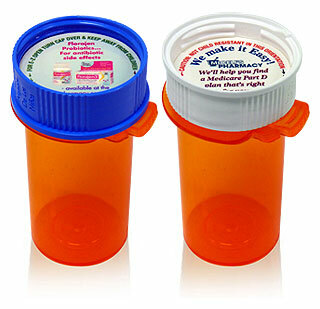 But the prescription container stays with each customer days, weeks, even months at a timeb>. With the ProTect® series, you can include a virtually limitless amount of information on both sides of the cap that will be seen every time the patient takes the medication. It's like placing a personal Pillboard™ in the hands of each customer - one that will be seen each and every day. TSD's unique high speed CMYK UV digital printing, with near-offset quality resolution and hundreds of colors, means you can print virtually anything on these caps. So if "branding" is important to you, don't settle for just your pharmacy name and phone number - after all, that info is already on the label. Instead, multiply the visibility of the closures with a virtually limitless range of designs, concepts, colors and information. This is what "enhancing your brand" really means - and it gets results. The ProTect® series closures come to you pre-lined. There are no extra steps for your staff. You can have numerous messages in one box of closures, or even two different messages on the same closure. The possibilities are endless, limited only by your imagination. If the vial you're using can't do this then it is time to switch to the multi-patented ProTect® reversible vial system, available exclusively from Tri State Distribution. For more information, contact your TSD representative at 800-392-9824. Sparta, TN - The Pillboard® system, a series of patented Rx vials and closures with unique marketing capabilities, has expanded to now include the ProTect® 33mm cap, which is compatible with the ProTect® 10 dram and 13 dram vials. Tri State Distribution, the leader in prescription packaging innovation brought the ProTect® series to the market in 2006 and incorporated the custom marketing cap in 2014. Since that time, the industry hasn't been the same. The unique and patented design of the ProTect® cap provides messaging opportunities on both sides of the reversible cap, creating unmatched marketing potential. Instead of using the prescription vial and cap as a “pill coffin,” designed to only hold the medication, the ProTect® vial and cap from TSD is a Pillboard®, or a personal billboard that fits into the hands of pharmacy customers, allowing them to see a store's brand and tailored messages each and every time they take their medications. “With recent technological upgrades to our printing capabilities, we can now offer up to 16 different messaging designs per case of caps with a 10 case minimum order,” adds Dave Miceli, TSD's Vice President. “This allows for a tremendous variety of communication opportunities, particularly effective when pharmacies are dispensing multiple meds to their customers. The wide variety of marketing messages ensures that customers taking home 3 or 4 prescriptions will see 6-8 different messages. There simply isn't any other product or program of its kind in the industry, especially when you consider that since our marketing team can put a customized program together for our customers and our graphics team does all of the design and printing all at no additional charge, it's like getting TSD's marketing and graphics teams included in the design and production of the custom caps at no additional cost!” The cap inserts are printed in gorgeous 4 color process using state of the art digital printers, resulting in messages that literally pop out at customers. For a complete list of offerings from TSD, including prescription packaging, labels, Kyocera printers and toner cartridges, visit TSD online at www.provial.com or contact the Tri State marketing team today at 800-392-9824.